We have just returned from a week staying at Locanda COS – accommodation at the Sicilian wine producer Azienda Agricola COS. You might already know that I am a bit of a fan of COS wines (see here and here for example), but you probably did not know that we have long intended to holiday in Sicily, amongst other things to take in some Greek temples, like the Temple of Concord at Agrigento shown below. What a great solution it was to stay at COS. I do not pretend to be a hotel critic or travel writer, so I am not going to dwell too much on the accommodation and the sightseeing. Let’s just say we would be happy to return, and if you want any more details please ask. However I feel confident in asserting that we were provided with great breakfasts, dinners and wine. The dinners, often just cooked for the two of us, were excellent. It is difficult to describe them briefly, as they varied so much. In the best possible sense they were rustic rather than sophisticated, and the flavours and flavour combinations were superb. Great raw ingredients were clearly an important basis for the quality of the food, but they were also put together very nicely. Our chef was usually Pino, but one evening Angela Occhipinti (Guisto’s sister) stepped in to offer us some local Sicilian dishes. The wine service was good, and equally varied. You really have to dine several evenings to get a good picture! When it was just the two of us, Pino usually opened a couple of bottles and let us get on with it. On other occasions, I think basically when new people arrived, Joanna joined us and guided us through smaller quantities of a greater number of wines. By the end of the week, we had worked our way through all the current COS releases (some more than once, but I am not complaining), and a couple of older wines. A sip of their experimental sparkling Frappato, white and with the base wine fermented in amphora, passed my lips too, but it was sadly corked. Our dinner hosts, Joanna and Pino are shown below. They both deserve a big thank you for making our stay there enjoyable. And here is the view from our apartment (Tramontana), over the vineyards to some mountains on the horizon. Just out of shot to the right, on a clear day you can see Etna. You can also see one of the COS dogs, keeping my wife company on an evening stroll. That particular one is easily distinguished from the others by his crazy sticky-out ears. But only the Pithos wines are fermented in amphora. 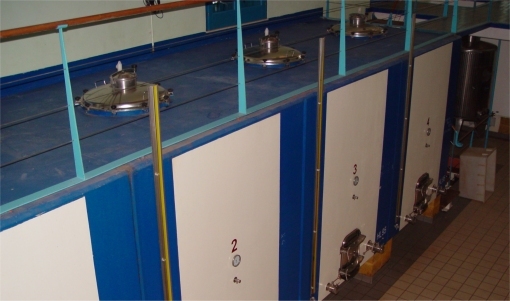 Most is fermented more conventionally in epoxy-lined concrete tanks in a recently designed building. Again the scale is not huge. You can see there are 4 pictured on the left, and there are another 4 to the right, and that is it. Gravity drives most of the flow. You can see where the tanks are loaded from the walkways at the top, which is close to ground level, and the large neutral barrels used for aging some of the wines are at a lower lever level than the fermentation vessels. Pumps only need to be used to get wine to the bottling line, which is again roughly at ground level. I didn’t hear the words “biodynamic” or “natural” mentioned once at COS, though I understand both terms apply to their wines. But there were a couple of hints given in the tour. One was the constant classical music being played in the main building with the concrete tanks, because the wines liked the vibrations. The amphora room however survived without – perhaps the amphoras were enough to compensate for the lack of music. The other hint was the reluctance to use stainless steel as a container, as it acts as an antenna and transfers unwanted energy to the wine. Firstly, some brief notes on the designations. 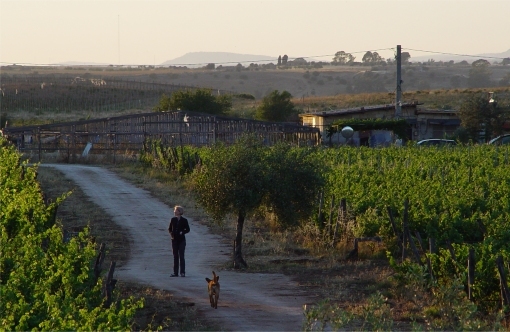 The most important local designation is Cerasuolo di Vittoria DOGC, which can also have Classico appended if the grapes come from a more restricted zone and the wine is aged a bit longer before selling. It is made from a blend of the local light and fruity Frappato variety, and the better known and more structured Nero d’Avola. 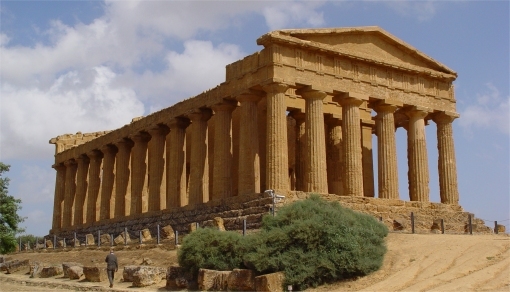 Typical proportions are 60-70% Nero d’Avola and 40-30% Frappato. 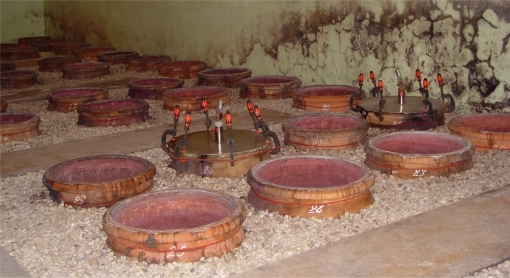 The COS Pithos Rosso blend would meet the Cerasuolo di Vittoria regulations, but the amphora vinification means it is not entitled to use the name. Recently the catch-all designation of Sicilia IGT ceased to exist, so producers now have to use an alternative on their labels – either Terre Siciliane IGT or Sicilia DOC on the label, depending on their wine and how they wish it to be perceived. The wines were each taken with one or more of the dinners we had at COS. This was an ideal way of appreciating them, but as the food was different on different occasions, any comparisons must be taken with lashings of salt. And, as ever, I make no claims to objectivity – indeed, I don’t believe it exists in wine tasting. The prices are approximate, or estimated, UK retail. The notes above are written in my usual telegraphic, rather grumpy, style, but I would like to stress that I enjoyed all of these wines, and was very happy to drink them with food over the course of a week. Not once did I think I’d really rather be drinking something else. I brought a couple of bottles of Contrada back with me, choosing that wine largely because it is not so readily available in the UK. Then, one of my first acts on returning home was to order a case of Pithos Rosso – now only 11 bottles. This entry was posted in General, My tasting notes and tagged food, italy, sicily, tasting note, travel. Bookmark the permalink. Sounds a really nice trip, Steve – will have to consider a stay at COS when I finally get to that (to me) neglected side of the island.